If you take one thing away from this BBQ Joint Review, make it this: You absolutely need to go to this place and try a “Turkey Rib” (which is not really a rib, but I’ll explain that later.) Flat out the best turkey I’ve ever had, including all preparation methods. I was blown away. 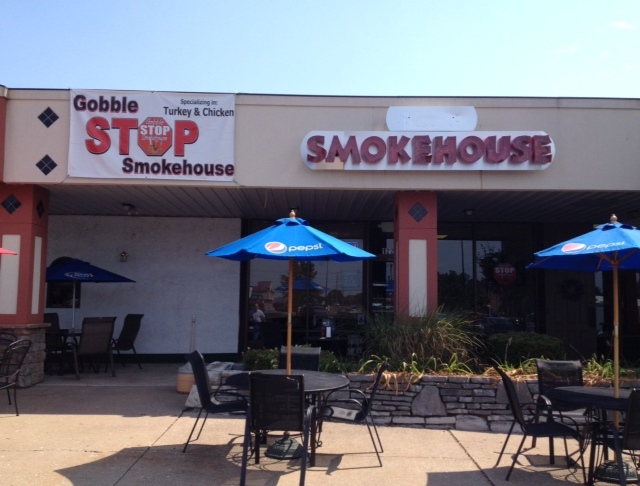 Third on my hitlist of relatively new BBQ places that need reviewing, per the STL P-D, is Gobble Stop Smokehouse in St. Louis County on Olive, near Fee Fee. An unassuming facade used by a prior (unsuccessful, apparently) smokehouse, in the midst of a Korean-filled strip mall. I phoned my father to see if he wanted to duck out of work (we’re both self-employed) to hit this poultry-only BBQ spot. Their menu did not have a hint of cow or pork or goat or non-winged four-legged animal. All bird – very ambitious. As someone who BBQs often, I can tell you that making poultry well is hard. It’s lean, so it can dry out. The dark and white meats cook distinctly. Seasoning can be tough with the skin and the depth of the meat. Making good turkey or chicken on the BBQ shows skill. I’m still working on it, and it’s a goal for me. I saw an article in the Riverfront Times that said that I needed to order the Turkey Tips, so I did. I added an unsweetened tea and side of beans (home made!). Why not toss in an a la carte turkey rib. 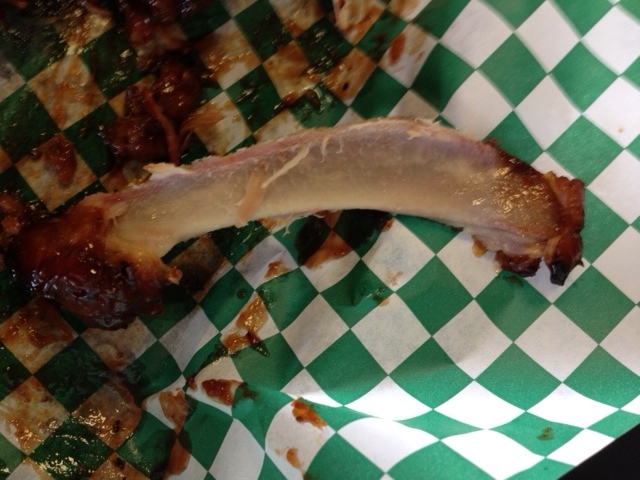 This is not a rib, though. It’s a part of the turkey breast carved from the scapula of the bird. 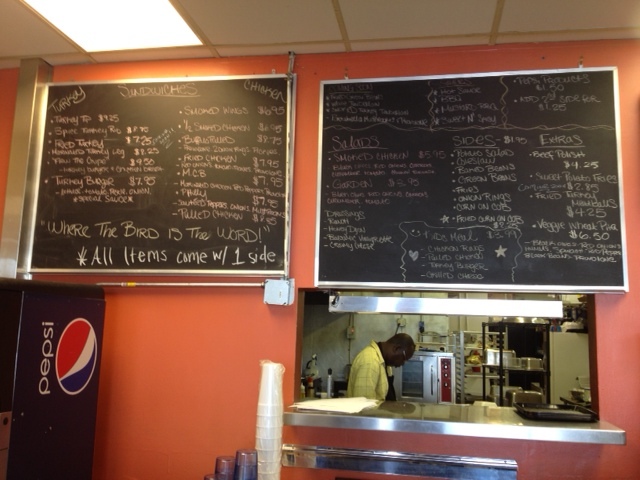 The owner served us and advised us on the lunch options. Based on the RFT recommendation, I was psyched to get the turkey tips. I’m a zealot for thigh meat (both chicken and turkey), so it seemed like a good choice. Basically it’s like pork tips but poultry. 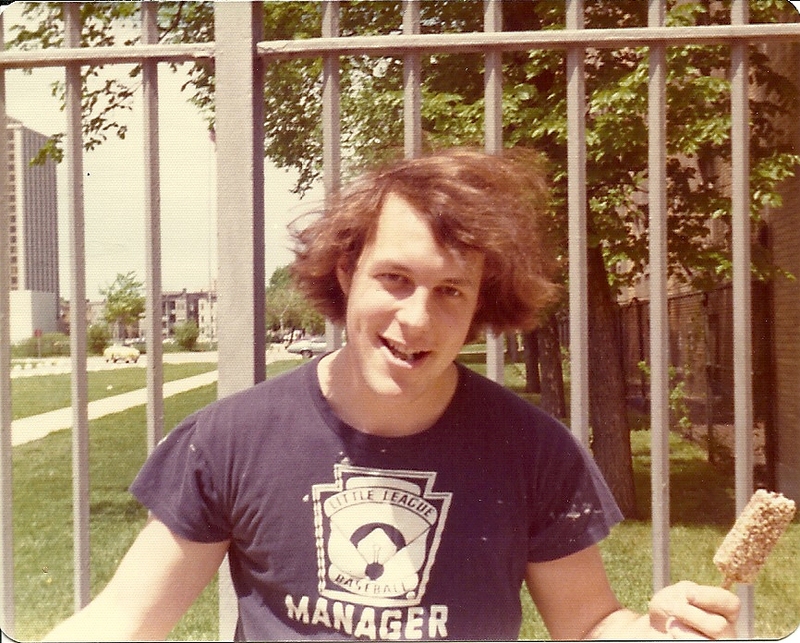 He warned me that each sauce-coated nugget was part gristle and part meat. From a textual point of view, I wasn’t psyched about sticking a gristle-filled nugget into my mouth to chew off the tasty bits, so I tackled these one at a time with a fork and knife. One of my gripes about this place is the plastic silverware. I get it, as a former professional dishwasher, that the cutlery is nice and disposable, but the turkey tips were hard to navigate with flimsy plastic forks and knives. With some effort, though, each nugget produced at least a bite or two of smoky, hyper-tender bird. The sauce was thick, sticky, spicy and incredibly wonderful. The meat was juicy and skillfully made. I really enjoyed it, despite the extra work. In the future, I probably pass on this one, given all the work, but I’ve never had anything quite like this before. Tasty tasty turkey. The best choice I made, though, was getting a turkey rib. What an amazing, succulent, tender, smoky, sticky piece of turkey meat. I was shocked. Literally, though this meat had bite, but fell cleanly off the bone. Solid smoke lines, great tenderness, solid sauce, excellent texture. I was blown away by the turkey ribs, which is a low calorie low cholesterol way to down BBQ and still feel like you’re crushing ribs. A thin slab of bone was all that remained. It’s a genius move, but you still have to do it perfectly. These guys did just that. The sauce was such an awesome pairing with the tender smoked meat. Really a surprising entree. My father ordered one a la carte as well and he decided, based solely on that sample, to come back six hours later for takeout dinner for him and my mother. She told me how much she liked it, too – no shock to me. Dad’s lunch was also wonderful. He grabbed the pulled chicken sandwich, with a side of onion rings. Dad’s chicken was really good. It seemed like the chicken was more chunked pieces than shreds. Moist, tender. 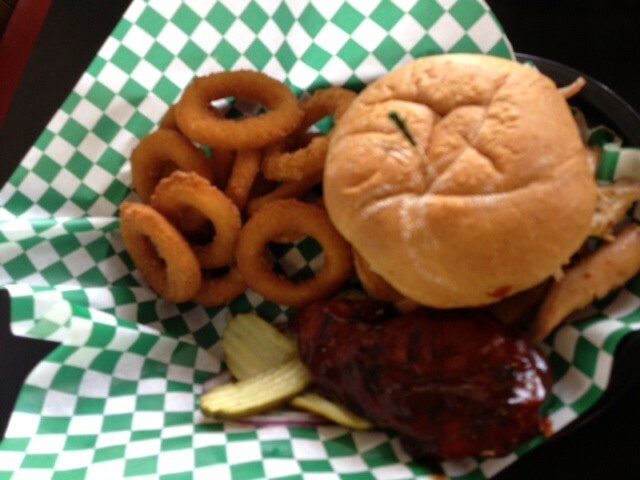 Hard to beat BBQ good enough to be served without any sauce (served on the side). There was a taste in the seasoning that I was struggling to pick up on… I swear it was some kind of Doritos nacho-y seasoning on the chicken. Really nice chicken, a great lunch. Onion rings… pedestrian. Thick breading, crispy coating, but probably came from a bag. Not bad but unremarkable. Beans were great. I got a nice pepper and cumin flavor, with a serious peppery spice aftertaste. Nice thick sauce and tender beans. Great appearance with good red pepper bits throughout. Excellent, particularly if they cooked them without any pork or beef. Getting a nice hearty flavor with no pork grease can be a trick. I’m very curious how these were made. The place was clean and quaint, and the owner was personable and polite. What’s not to love about Gobble Stop. I tried to buy a cookie after our late lunch… he gave me a lemon sugar cookie on the house. Great cookie. Moist, without any superfluous powdered or crystallized sugar on it. I 100% guarantee that I’m returning to Gobble Stop Smokehouse. Epic meat. Wonderful service and atmosphere. 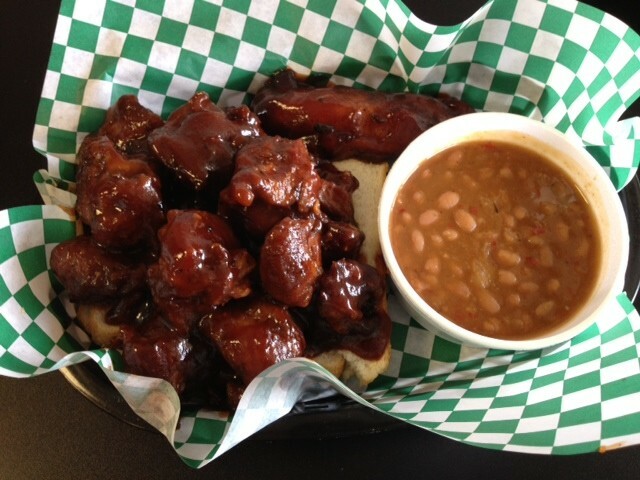 You don’t always need to eat pig or cow to get top notch BBQ, and Gobble Stop is proof.